The death last year of a woman in Reno, Nev., from an infection resistant to every type of antibiotic available in the U.S. highlights how serious the threat of antimicrobial resistance has become. Washington State University scientists are addressing growing global concern about the spread of antimicrobial resistance in Africa, where the World Health Organization predicts that, by 2050, drug resistant tuberculosis and other bacteria could lead to the deaths of 4.15 million people each year. Their work identifying practices that lead to bacterial transmission could help save African lives and prevent the spread of antibiotic resistant bacteria to the U.S. and other parts of the globe. Doug Call, a professor in WSU's Paul G. Allen School for Global Animal Health, Robert Quinlan, a professor in the Department of Anthropology, and Mark Caudell, a postdoctoral fellow, are the lead authors of a recent study in PLOS One investigating how human behavior, cultural context and living conditions in Tanzania affect the transmission of antimicrobial resistant bacteria from livestock to humans. "If our work points to specific interventions, then it may be possible to reduce the burden of antimicrobial resistance and to help African families have heathier and more productive lives," Call said. "Addressing this problem now will also help us confront the risk of resistance traits and pathogens moving to other countries," he said. "Spokane (Wash.) is only two or three airline flights from just about any place in the world - meaning that antibiotic resistance can spread rapidly at a global scale and affect all of us." The frequent and unregulated use of antibiotics on livestock is a potentially significant contributor to the transmission of antimicrobial resistance. The practice is widespread and understudied in low-income African nations like Tanzania where Call and Quinlan conducted their study. The researchers surveyed members of three indigenous groups, the Maasai, the Arusha and the Chagga, to determine how 200 different socio-economic variables impacted both the use of antimicrobial drugs and whether a withdrawal period was being observed before the consumption of meat and milk from inoculated animals. They found the Maasai were far more likely than the other groups surveyed to administer antimicrobials without the assistance of professional veterinarians, and only 7 percent of the Maasai households reported withdrawing from meat and milk consumption during and following antimicrobial treatment. In comparison, 72 percent of the Arusha and 96 percent of the Chagga observed the withdrawal period. The factors influencing the unregulated use of antimicrobials and the observance of a withdrawal period varied between the groups, the researchers found. For example, among the pastoral Maasai, consultation with veterinary professionals was negatively associated with the use of traditional healers, and observation of the withdrawal period was most strongly associated with owning technology. Quinlan and Call are now analyzing bacterial isolates from people, livestock, poultry and dogs from the majority of the interviewed households as well as from wildlife. Their dataset includes over 50,000 bacterial isolates that will enable them to link the prevalence of antibiotic resistant E. coli and other bacteria to specific practices that can be changed. 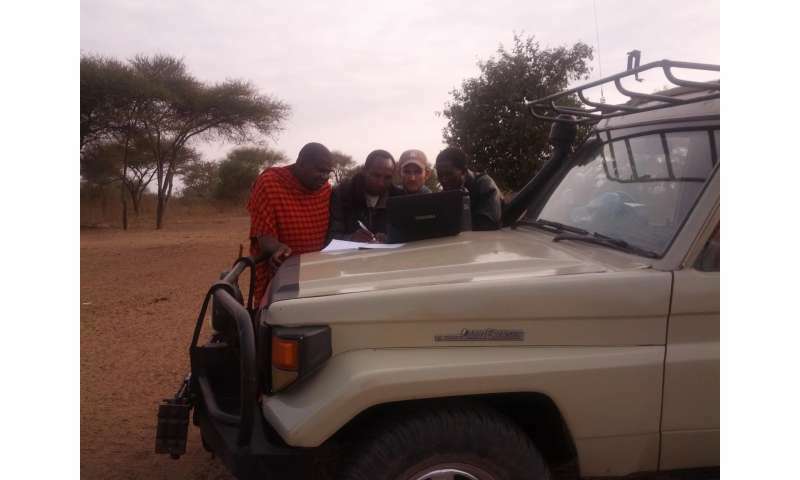 In addition to the research component of their work in Tanzania, the WSU team is also helping the Maasai to integrate simple practices and tools into their day-to-day lives to address the spread of antimicrobial resistant bacteria. This summer, Quinlan and WSU undergraduate interns will go to Tanzania to teach Maasai pastoralists simple, culturally appropriate methods for estimating livestock weight to prevent the over-dosing of animals. The research team also has partnered with Marie Mayes, director of the WSU Center for Entrepreneurial Studies, and undergraduate students Annalise Miller and Victor Charoonsophonsak to develop a new digital thermometer to help the Maasai pasteurize milk, which will reduce the ingestion of antibiotic-resistant bacteria and pathogenic organisms. Their work fits into WSU's Grand Challenges, research initiatives aimed at particularly pressing societal concerns. In particular, the multidisciplinary team is helping address the challenge of sustaining health by tackling the onset and progression of disease and promoting healthy communities. "Our study shows the risk factors for carriage of antibiotic resistant bacteria will vary depending on the socio-economic and cultural context of the population being studied," Quinlan said. "It provides us with valuable information for the design of simple interventions for these communities."